PA chairman reiterates he can no longer accept the U.S. as mediator in peace talks, as Trump tells Putin it's time to work on peace. 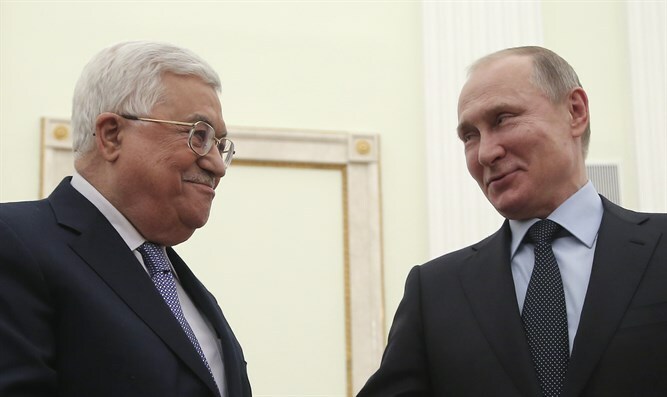 Palestinian Authority (PA) chairman Mahmoud Abbas told Russian President Vladimir Putin on Monday he could no longer accept the role of the United States as a mediator in talks with Israel because of Washington’s behavior, Reuters reported. “We state that from now on we refuse to cooperate in any form with the U.S. in its status of a mediator, as we stand against its actions,” Abbas told Putin at the start of talks in Moscow. The PA chairman said he wanted an expanded new mediation mechanism to replace the Middle East Quartet. Abbas reacted in anger in December when U.S. President Donald Trump recognized Jerusalem as Israel’s capital and set in motion the process of moving the U.S. embassy from Tel Aviv. Following Trump's Jerusalem move,Abbas declared that he would "no longer accept" any peace plan proposed by the United States. He is due to speak at the United Nations Security Council on February 20, where he is expected to respond to Trump's recognition of Jerusalem. Despite Abbas's refusal to have the U.S. involved in the peace process, Putin said at the start of the meeting with Abbas that he had spoken by phone with Trump about the situation between Israel and the PA.
"I just spoke with American President Trump," Putin was quoted by the Russian TASS and Interfax as telling Abbas before holding talks behind closed doors. "Obviously we spoke about the Israeli-Palestinian conflict." Hours after the meeting, the White House confirmed a phone call had taken place, saying that Trump had told Putin that now is the time to work toward a peace agreement between Israelis and Palestinians. The Russian leader has in the past expressed a desire to host an Israeli-Palestinian summit to revive the talks but nothing has materialized yet in this regard.